This is a very easy and delicious dish, and it works great as a starter or side dish. You will need, shrimp, garlic, butter, olive oil (or grape seed) and red pepper or chili flakes. If you are planning to put the pan on the serving table, use a cast iron pan if you have one – the cast iron pan looks great for presentation! Start with roasting the garlic in the pan (one or two cloves), then add the olive oil (grape seed oil will be good as well). Once the garlic is caramelized, add the chili flakes, butter and then the shrimp – the shrimp will cook very quickly (2-3min on med-high heat). 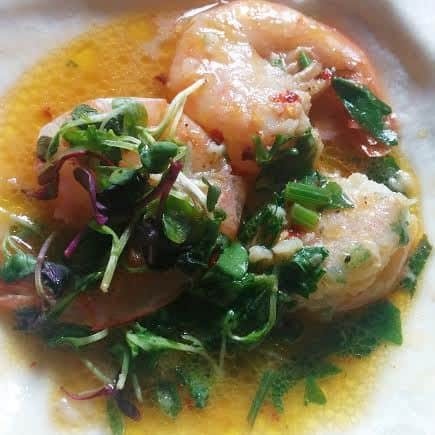 Finish with micro greens and fresh lemon juice. This dish would pair well with a Riesling.